Prejudgment Interest and Post-judgment Interest - В сложной финансовой ситуации приходит на помощь кредит наличными в Казахстане. Prejudgment interest is routinely a component of a claimant’s monetary damages. The claimant wants prejudgment interest on the principal amount due and owing. If no interest rate is set forth in the claimant’s contract, then the interest will accrue at the statutory rate. Then, once a judgment is entered, post-judgment interest will accrue on the judgment until it is paid. See Florida Statute s. 55.03. 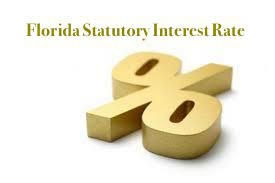 Florida’s statutory interest rate is set by the Chief Financial Officer and published here. $100,000 x .000130137 = $13.01 per day x 125 days = $1,626.25.